We can remove your old timber casement or aluminium windows and fit new ones to all types of house construction. Without the need to remove the surrounding timber reveals, we can keep the costs down and make window replacement an attractive option to modernise your home. If your old glass sliding doors are hard to operate, no longer secure, or you just want to change the configuration of the opening, we can replace them with new glass sliding doors. We can also install glass and aluminium French doors, and sliding stacker doors to really make the most of a large opening. A popular way of gaining more space is to remove the garage door and fit glass sliding doors or window units. With some new floor coverings and a coat of paint it is possible to add an extra room to your house for a fraction of the cost of a major renovation. We can even help you arrange to have a carport fitted if would like us to. We can supply and install fly screens, security screens and crimsafe screens to virtually all of the products we sell. We only use genuine Crimsafe Screens so you know you are getting a quality product. Not a cheap imitation. We can replace existing timber or sliding wardrobe doors with new ones. With a huge range of colours and mirror or vinyl doors, it’s easy to update the look of any room with very little hassle. See two of our featured projects. If you have a project that requires Aluminium doors or Aluminium windows, contact us today. 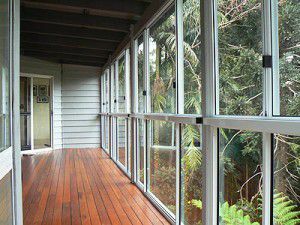 If you have added a deck or need more access to your outdoor area we can remove a window, cut the walls down and fit aluminium sliding doors. This is usually done without the need for any structural changes to the house. This means no planning permission or builders’ costs. 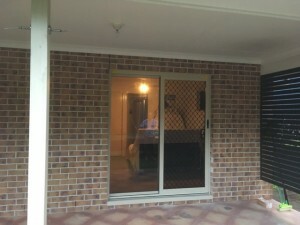 Suitable for brick or timber homes this is a great way to open up your home to the outside. Another great way to add room to your house, by enclosing a patio or veranda you can make the most of what you have. Perfect for a play room for the kids, home office or just that much needed extra space.